Never use the valet service at the hotel. One half hour wait to check in car. One hour wait to get it back. There are many garages in the area for the same price or less with much better service. Location was good for us because it is close to family. Beds were comfortable. Negatives: 1) Late night security staff: rude with no social skills. 2) Breakfast or room service not available. 3) Restroom bath tubes: deteriorated. Shampoo and Conditioner quality: low. 4) Bell boy service. Not available. I have stayed at this location many times over the past year. Each time the experience is enjoyable and the staff is fantastic. Lisa who works the check in desk is always delightful and a wonderful addition the the hotel staff. convenient location coming from the northeast. affordable self-park 1/2 block away. Comfy hotel, nice location, convenient to everything. We liked our room and our stay. We arrived early to the hotel the first day, and weren't pleased to see that our bags were stored in an unlocked area in the lobby. The hotel was nice to let us check-in a little early, though. The hotel was in a great location pretty close to a train stop and restaurants/bars. Clean, decent, no amenities, nothing special! Great staff! Enjoyed our stay! Have stayed here before, and will likely come back. Thanks! Good place to stay in NYC. Nice comfortable room with quality linens. Safe walk to subway, even if it was a little on the long side. The hotel staff was great. The two elevators that service all guest floors are very slow and we spent a long time waiting for them. The rooms are in need of some renovation but overall the hotel met our needs. Always a great stay when I’m in the city! The staff is friendly and helpful. There were TEo cockroaches in my room and the hotel staff was rude and did not help me remove them. Apart from that would change me to the same room I paid. I arrived to the hotel late after a long day of work and travel. Welcomed by Lisa at the desk who was extremely helpful and friendly. Much to my surprise, I was given a room upgrade!! The hotel was lovely and the staff was great! Will stay again in he near future. Located in Upper East Side, Courtyard by Marriott New York Manhattan/Upper East Side is within a mile (2 km) of popular sights such as Central Park and Solomon R. Guggenheim Museum. This 226-room, 3.5-star hotel has in-room conveniences like refrigerators, microwaves, and coffee makers. A TV comes with cable channels and pay movies, and guests can stay connected with free WiFi and wired Internet. Beds sport premium bedding and the bathroom offers a hair dryer and free toiletries. Other standard amenities include a refrigerator, a microwave, and a coffee maker. 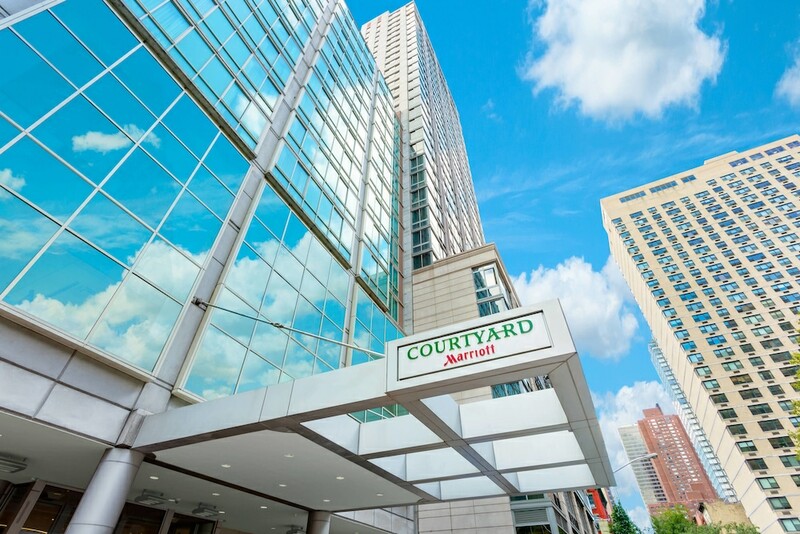 At Courtyard by Marriott New York Manhattan/Upper East Side, guests have access to a 24-hour fitness center, free WiFi in public areas, and a business center. Valet parking is offered for USD 67 per night. The front desk has multilingual staff on hand 24/7 to help with dry cleaning/laundry, securing valuables, and luggage storage. Additional amenities include coffee/tea in a common area, express check-in, and express check-out. Recreation features at Courtyard by Marriott New York Manhattan/Upper East Side include a 24-hour fitness center.